Located in Lerwick's conservation area and well placed in the centre of Lerwick's Commercial Street, the imposing 3 Star Grand Hotel is right at the heart of Shetland's busiest thoroughfare. Offering well appointed and comfortable en-suite rooms, excellent car parking, and easy access to just about all the local facilities. Whether your requirement is for Bed and Breakfast, a holiday base or a longer stay, it is in an ideal location for business people and tourists alike. Some of our rooms offer an elevated view over Lerwick harbour to the island of Bressay. If you would like one of these rooms, please advise our reception staff when booking. A writing Desk, Wardrobe, Bedside Cabinet(s), Television, Kettle, Tea and Coffee, Milk and Sugar, Bottled Water, Biscuits, Soap and Shampoo, Hair Dryer, Trouser Press, Telephone. We have multiple Access Points installed throughout the hotel and Free Dual Band High Speed WiFi Internet Access is available in all bedrooms, public Cafe Bar areas, Breakfast Room, and our Restaurant. The Grand hotel restaurant is open 7 days a week for breakfast ,(7:30 - 09:00am weekdays, 08:30am - 10:00am Sunday) , lunch,(12:00 - 14:00pm) and dinner, (18:00 - 21:00pm), and whenever possible, our team of skilled chef's serve the best of local produce. Guests and members of the public are very welcome to use our facilities and may take their meals (with the exception of breakfast) in the bar areas if preferred. Guests may also take their meals in their rooms if required. We also have a number of "special occaisons" menus which are published in advance on our Facebook page. Guests and Visitors should note that, although we are not licenced to sell alcohol before 11am, in addition to a good selection of beers, wines, spirits and cocktails, the Grand Hotel also specialises in Gin and keeps a formidable list of more than 50 different varieties with something to suit every taste. 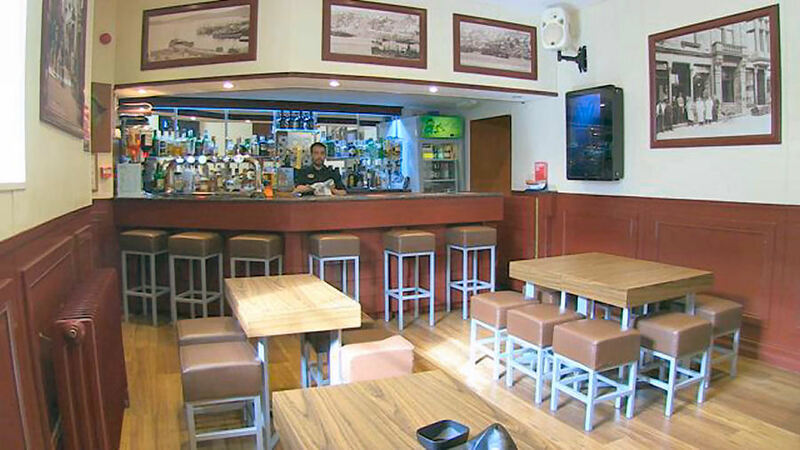 The Public Cafe Bar and a Lounge Cafe Bar that are also able to provide a wide range of tea's and coffee's plus a selection of sandwiches, cakes, biscuits and snacks. 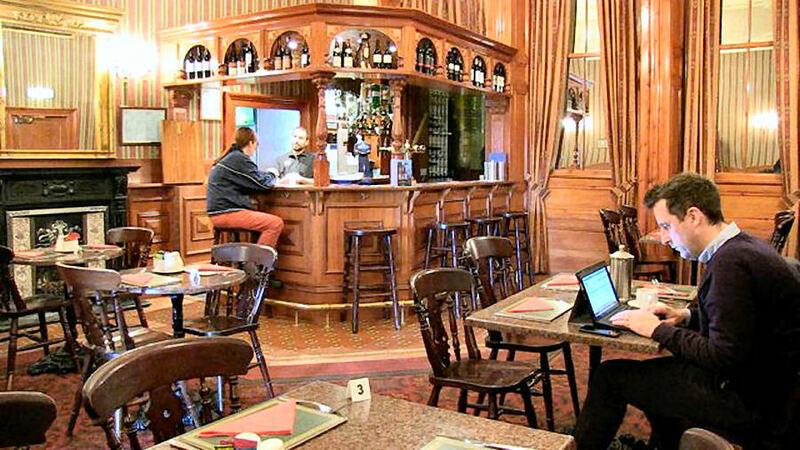 Both bars are quite popular with those that want a coffee and sandwich, a quick snack, a bar lunch or early evening meal. Although our menus change regularly, sample menus for the Grand hotel are available from the link at the top of this page. Please contact our reception staff who prepare menus daily and will be able to tell you what is on offer. The Grand Hotel is also home to the ever popular Posers Nightclub which operates from 10pm Saturday nights until 3.00am Sunday mornings (and occaisonal Friday Nights). Guests staying over a weekend are invited to pay this very lively venue a visit and party with the locals. We welcome guests and visitors of all ages and abilities and, whilst our staff will assist in any way they can, we have to advise that due to the age and design of the building, wheelchair access to The Grand Hotel is non-existent. For those with vehicles, the Grand hotel has a large and easily accessible free car park at the rear of the building. We are happy to host conferences, trade shows, meetings and interview sessions, and have ample space available for theses activities. The Grand Hotel has a reputation for offering outstanding value and a unique experience. Whenever you think of a break, just contact our friendly reservation staff who can offer special discounted Direct Booking Room Rates that are NOT available to those who book via on-line booking sites.